They weren't in flower but, the seed heads practically called my name as I passed by them. they were stand out gorgeous. Set on two or three foot stiff gray stems they made a big statement. one of hundreds of fluffy seedheads at C and L! I love fluffy aster seedheads! But, my friends, these were special. I don't know if these photos capture how truly special. If you enjoy the look of fading flowers and plants gone to seed you will find beauty in most plants at the end of their season. You won't have to look far to find a bit of pretty in Mountain Mint. Non gardeners might see plain old gray seedheads and wonder what in the world is she talking about! I'm pretty sure Mr I would be rolling his eyes. Don't they know! Gray can be so much more then...well, then gray! I wonder where all the seeds were dispersed! My eye sees the lavender in the gray. That's what caught my attention as I was wandering up and down the plant nursery lanes. Not plain or boring at all...a lovely shade of gray. Now for the particulars! As you may have already guessed this mint plant has all the properties of most mints! Spearmint scent when the leaves are crushed and it's said it makes a nice tea. Like other mint relatives...it's an enthusiastic grower if you love it and a thug if you don't! 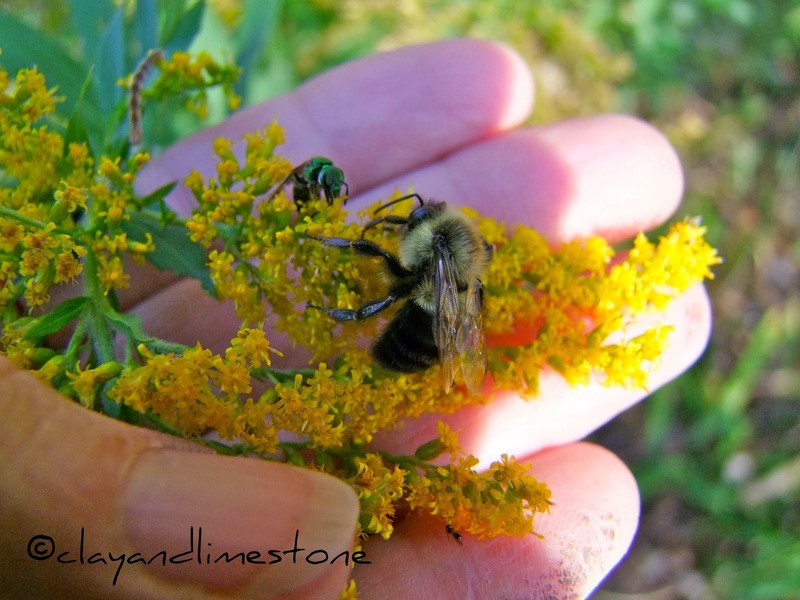 Plant it with false dragonhead/obedient plant and monarda/bee balms and let them duke it out! I think it could look good with the variegated river oats I got this past spring! Btw, that's another enthusiastic grower. Surely, you have a spot for this sweet native! I hope it likes C&L! I had this in my garden a few years ago and loved it. It has the most delightful smell when the leaves are brushed. It did remind me of mountain air. I love the look of this plant and I wonder if I can find it here, so it will go on my list ! I used my baptisia seed branches to make noises in my Halloween urn with the straw and pumpkins .. I thought it would be fun and they look great actually. I saved my butterfly weed seed pods and they burst while in storage in the shed .. I'm wondering if it is too late to scatter them, but I will try in any case. Even gray is a "cool" colour in the Autumn garden ! The fact that mountain mint is hardy in zones 3-9 caught my eye. I don't see pink at all, just a very pretty green and white. The flowers do remind of poinsettia. I always enjoy seeing fluffy in the garden. Thanks for making me look at gray in a different way. You have a painters eye to see all that color in those pods Gail. I have seen mountain mint on Sue's blog and actually they were giving it away at PPS. It is most nice. I may try it. I went to GroWild too and was most impressed. Very well run sale with lots of help. Tina, Giving it away! Did you take some home? and doesn't that tell you that it is vigorous! Donna, See above response to Tina...It is vigorous! Lisa, Thanks, I wish I could paint like you. Joy, The seed heads in your decorations sound perfect. I think that the only thing butterfly weed needs is cold, wet weather to help it grow. So scatter it now. I will be watching my p's and q's and of course my w's and s's! Jan, Did you evict it from the garden? Morning Gail, we have Narrow-leaf Mountain Mint Pycnanthemum tenuifolium, in the Learning Garden and I like the look of yours ever so much better. Ours doesn't seem to be invasive (or aggressive) which is good. That is a lovely mint Gail. The flowers look to me like a cross between a dogwood and a poinsetta. I don't see pink either, but silvery white. I agree with Lisa -- you do have a painter's eye to see all of those colors in the seed heads! Can you use this mint in teas? It looks great as dried seed heads. Have you saved any seed by any chance? Love the seed heads. I collect huge bunches of dried grasses and seed pods every fall and make baskets of them with dried flowers, stuff like that. I'll watch for these and try to find a few for my garden. I've always loved mountain mint, Gail, but never saw its poinsettia-like properties! Thanks so much for a delightful image. I'll never look at mountain mint the same way again! I'm glad you profiled this plant, Gail. Mountain mint is a butterfly favorite and a little-known gem. We have Pycnanthemum virginianum here in the Upper Midwest. And your advice about planting it with Physostegia and Monarda is spot on! Replicating that type of native competition is the perfect way to keep them in line! A very lovely grey/lavender shade. And I bet it adds a lot of texture to the fall garden. You have a wildflower nursery near by? How wonderful. Good info... I might try this. I will add to my plant list. Thanks for the stats, Gail. You reminded me that I have to dry and save herbs. Ok, I still have time... phew. Fluffy heads are pretty cool looking. Haven't tried making my own tea in ages, maybe I should. Hi Gail.....the little carder bee looks tired. They always lose their colour as the season comes to an end. I adore seedheads....especially when they are covered in frost. Hi Gail, never heard of Mtn Mist but it sure looks pretty. I see the grey/deep violet with a hint of blue. I doubt it would survive this heat/humidity. Seed heads look so fragile to me. But I really like them. I have an Iris 'Billionaire' blooming now. A lovely golden yellow. I believe it's what is called a re bloomer. Nice this time of yr.
Gail the mountain mint looks a lovely plant and the seed heads are nice but asters do seed all around so if left not that I ever find time to cut them. Gail, I think you have the perfect plan for Mountain Mint-planting it with the false dragonhead and bee balm. I can see all those colors mixing and looking great. I have learned so much from these Wildflower Wednesdays. Thanks! this mint is beautiful and white. i love the little bracts surrounding the tiny flowers. we had a lot of different mints in our large veggie gardens...the boys enjoyed planting them and they did do very well. can you plant this now? the seed heads are gorgeous...i adore them. i love seeing spent flowers...it means you had flowers. i still haven't visited growild but i need too. Enjoyed your eulogy of seed heads! Many California natives have lovely seed heads too - erioganums in particular. I specially love the big flat umbels of Erioganum giganteum, St Catherine's Lace, which start white and turn through creamy to a rich red rust to dark brown. Other erioganum flowers are like little pom-poms and go through similar transformations. Nice bee too! I love the way the mountain mint looks like a dainty version of poinsettia. I'm not seeing any pink in the bracts, either, but the white is nice. Of course, I am trying to cut back on all the white flowers I buy. I'm totally taken in with their pure blossoms, but too many of them in my garden are making it kind of boring. Maybe you have to either go all wite or just use white sparingly? Who knows. Great photos of the seed pods. And what's not to like about the silvery green foliage of the Mountain Mint... a new plant for me. very pretty Gail! I'm a bit gun shy of mints and the way they spread, but this one is mighty tempting! I have posted on my experiences with this short toothed mountain mint, and Virginia mountain mint. They both seem to spread out from the center, and have not so far sent runners out far and wide like other mints do. I thought the short toothed one, which I just planted last year was going to this spring, but I pulled up last year's stems that were starting to take root, and then it did fine, and did not spread further. So, here in zone 5b Nebraska, I haven't found either to be invasive. 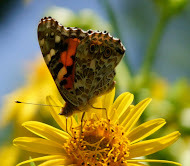 The one thing to be aware of if you like to plant for butterflies, is that these both attract wasps. I don't know which kinds of wasps eat which kind of caterpillars, but I have seen several kinds of wasps on the mountain mints. They get lots of large black wasps all over them. Here is a link to my posts on them. It will be interesting to see how far yours spread in Tennessee. Oh, dear, Gail, I just put up a post to say I was wrong about short toothed mountain mint sending out runners! What I thought were fallen down stems that had rooted were most likely runners. I am glad you wrote this post, or I may have missed all the runners and new plants forming on them. I forgot to say on my post that some of the runners were over 2 feet long. I'll have to go add that. I hope I got them all pulled. I will be checking them more often. I was talking about spring, when I thought the runners were fallen down stems. I have a Mountain Mint it looks trhe same as this one you posted. It was given to me by a friend the the NC Mountains, now it has taken over a 4 ft by 10 segment of the garden lots of bees, butterflies and wasps. Nice! Mountain mint (Pycnanthemum virginianum) is a Michigan native. Both it an the muticum are very cute! resolved. There are many reasons why people prefer playing online casino games and among them is the fact that casino games tend to be quite interesting and fun to play. over the internet and so as gambling. The glossy surface adds contrast to the textured battery compartment above the keypad. click the left analog stick to run.